Dr. Kiran Khan, the elder daughter of Mrs. Zohra Iqbal & Engr. Iqbal Ahmed Khan, Vice President SAEEA, was born in Karachi. She studied at Gulistan Shah Abdul Latif School and did her matriculation in 1990. Dr. Kiran did her intermediate (Pre-Medical) from P.E.C.H.S Girls College in 1993. She was admitted to the Medicine at Hamdard College of Medical and Dentistry, Hamdard University under the supervision of the great scholar, researcher, humanitarian, philanthropist, and excellent physician Shaheed-e-Pakistan Honorable Hakim Mohammed Saeed Sahib. She graduated with flying colors among the top five graduates of the batch. She did her house job at Taj Medical Complex Hamdard Hospital in Gynecology and Medicine. Dr. Kiran completed her first post-graduate diploma of Diabetology & Endocrinology from Baqai Institute of Diabetology and Endocrinology under the supervision of Professor Dr. Abdul Basit in 2001. She practiced Endocrinology with special interest in infertility at Hasmani Hospital, Saddar and later joined Department of Community Medicine at her mother institute i.e Hamdard College of Medicine and Dentistry in 2006. Dr. Kiran completed her Master of Public Health (MPH) degree from Baqai Institute of Health Sciences, Baqai Medical University in 2014. 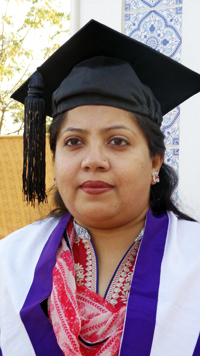 At present she is working as Assistant Professor at the Department of Community Health Sciences, Hamdard College of Medical and Dentistry and apart with medical teaching assignments she is heading three Basic Health Units (BHUs) being organized by Hamdard in low-income localities in suburban areas of Karachi. Dr. Kiran is happily married to Dr. Ata Ur Rehman who is a medical educationist and herbalist, they both having three children Obaid, Habib, and Mariam studying at school level. SAEEA wishes her a bright future.